Have you ever experienced either sudden extreme shooting pain or extended dull pain in your upper-right abdomen immediately after consuming a hearty and delicious meal? You might think that it’s just indigestion, heartburn, or a stomach ache of some kind. But what if it’s something more serious than that? What if that pain in your upper-right abdomen is a symptom of a deeper underlying health problem? If it’s accompanied by other symptoms such as vomiting, dizziness, nausea, pain throughout your neck and shoulders, or a high fever, then you should consult your doctor posthaste. Any combination of these symptoms along with pain or discomfort in the upper-right abdomen could be indicative of gallstones. Let’s start with a little anatomy. Your gallbladder is the tiny organ located between your liver and small intestine, all of which reside in the upper-right side of your abdomen, which is why you feel pain there during a gallbladder attack. The liver and gallbladder are connected by the bile duct, which transports bile from the liver to the gallbladder to help process and break down nutrients in food. Then, this matter travels from the gallbladder through the cystic duct to the small intestine for digestion. Foods that are high in cholesterol are particularly difficult to process. If your diet contains high amounts of saturated and trans fats or foods that are high in cholesterol with very little nutritional value, your gallbladder will have a hard time breaking down this type of matter. Eventually, this matter will harden and crystallize into gallstones and remain in the gallbladder, causing a blockage in the cystic duct that leads to the small intestine. If gallstones are left untreated, your gallbladder will become inflamed and expand to a much larger size than normal, leading to all or some of the abovementioned symptoms, including pain in the upper-right abdomen. This condition is known as cholecystitis and luckily, it’s highly preventable and treatable if caught early. There are several treatment options to either surgically remove or medically dissolve gallstones. These vary from one patient to another and your doctor can help determine the best method for you. They may also give you pain medication. 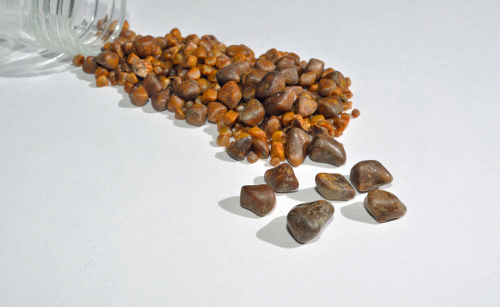 “Gallstones,” Canadian Liver Foundation; http://www.liver.ca/liver-disease/types/gallstones.aspx?gclid=CjwKEAjw6e_IBRDvorfv2Ku79jMSJAAuiv9YwVlppYA4gfY-xKozFho70vnkZP5P7yNYf956Na6x_xoCJSnw_wcB, last accessed May 17, 2017. Hayward, J., “7 Symptoms You May Have a Gallbladder Problem,” Active Beat, September 26, 2016; http://www.activebeat.co/your-health/7-symptoms-you-may-have-a-gallbladder-problem/?streamview=all, last accessed May 17, 2017. “Cholecystitis,” Mayo Clinic; http://www.mayoclinic.org/diseases-conditions/cholecystitis/basics/definition/con-20034277, last accessed May 17, 2017. “10 Symptoms of a Gallbladder Attack,” Active Beat, June 20, 2013; http://www.activebeat.com/your-health/women/10-symptoms-of-a-gallbladder-attack/?streamview=all, last accessed May 17, 2017. Davis, C.P., “Gallbladder Pain (Gall Bladder Pain),” MedicineNet.com; http://www.medicinenet.com/gallbladder_pain_gall_bladder_pain/article.htm, last accessed May 17, 2017. Siddiqui, A., “Overview of the Liver and Gallbladder,” MSD Manual (Consumer Version); http://www.msdmanuals.com/home/liver-and-gallbladder-disorders/biology-of-the-liver-and-gallbladder/overview-of-the-liver-and-gallbladder, last accessed on May 17, 2017.